Matt Lorenz began experimenting with junk when he was a kid. Growing up in rural Cavendish, Vt., he started with dismantling random electronics gleaned from his family's weekly trips to the local dump. Back then, the only instruments Lorenz played were his violin and the free piano his family received from the public library — which he and his sister fought over. Now, Lorenz's junk is his backing band. 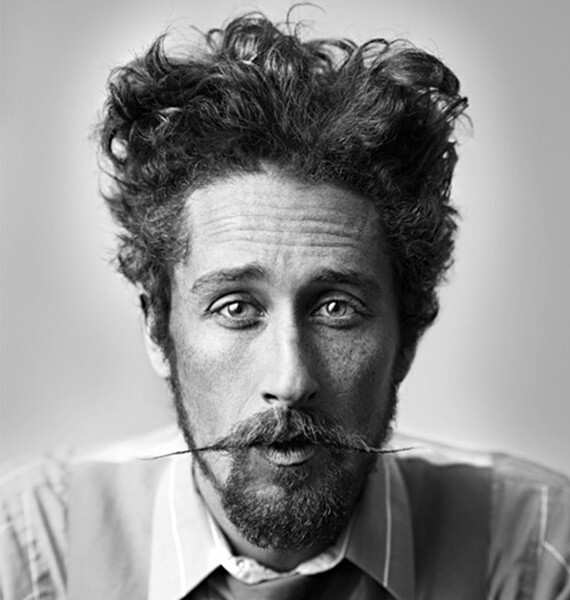 Better known as the Suitcase Junket, he's a one-man band that creates a harsh-but-hypnotizing sound with a guitar and an array of found objects repurposed as instruments. Lorenz performs at Signal Kitchen in Burlington this Saturday, November 14. Now 33, Lorenz has a lax posture and an easygoing aura. His wiry, dark-brown hair is kept short on the side and longer on top. His narrow face tends to be in a permanent smile, as if that were its resting position, and is garnished with a long, impressively curled mustache. Lorenz swears he normally doesn't use wax; his facial hairstyle is just the product of particularly fidgety hands. But when Lorenz finds himself on the road for a couple of days without a shower, when his mustache is getting squirrelly, he'll dab a bit of wax in it so it doesn't take out an eye, he says. Lorenz is well-spoken, and his hair and outfits are dashing. His look seems most complete, however, when his self-made instruments surround him. Lorenz's "band members," as he likes to call them, include an oversize suitcase that doubles as his stool and his bass drum. His left foot controls a pasta pot and a circular-saw blade, as well as an old gas can with a baby shoe as a drumstick. The shoe, which he wore as a child, has beaten through four pieces of metal. "It's super rugged," Lorenz says. As his right heel thumps on the suitcase, his right toes simultaneously control a hi-hat cymbal along with "a box of bones and silverware that operates very much like a hi-hat," the musician explains. The bottom of this hi-hat is a wooden box; the top is an 8mm film reel with a mix of deer, sheep and chicken bones, silverware, and other random knickknacks hanging on string. All together, this produces a crunchy sound, as the objects dance like marionettes in the box. 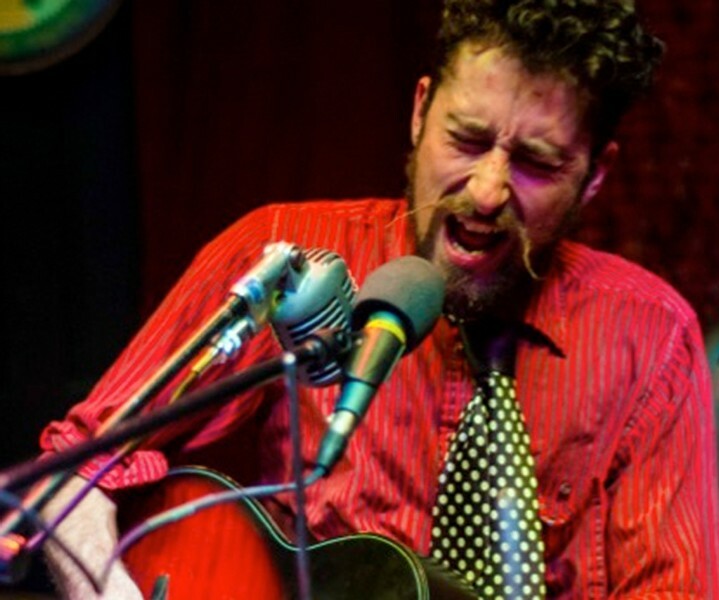 Suitcase Junket's percussive sound is tied together by a guitar Lorenz found in a Dumpster in 2008 while he was a student at Hampshire College in Amherst, Mass., studying experimental composition. "It was a crappy little toddler guitar filled with mold," he says. He cleaned it with vinegar and began messing around with it. It didn't sound very good, he says, so he put it in open tuning and started playing songs on it with a slide. Lorenz tunes to the guitar's own preference, which usually changes with the seasons. During the summer, he says, the guitar sounds best in open C; in winter it shifts to open C sharp. "The guitar is actually pretty bossy," Lorenz says with a laugh. Sometimes Lorenz sings into the hole in the body of his acoustic guitar. He vocally produces the same note that the string is tuned to, forcing it to vibrate and create sound — a technique known as sympathetic resonance. Lorenz has an air of transience about him — wanderlust, as if he won't be in any one place for too long. On his 2015 album Make Time, opening song "New Old Friend" supports this idea: He sings about the soles of his feet getting tired and warbles that he was "Born to wander free, born to cross both land and sea." Though he presents the image and tone of a vagabond folk singer, Lorenz is equally influenced by rock. Listen closely to his music, and you'll hear shades of the Black Keys and Led Zeppelin. On "Earth Apple," the second cut on Make Time, Lorenz doesn't hold anything back. The percussion is heavy and tumultuous, the drive on the guitar crunchy. When paired with his scratchy vocals — and sympathetic resonance — the sound is full and forceful. Lorenz is fresh off a tour of Ireland that lasted most of October. Earlier this year, he mesmerized an audience at Otis Mountain Get Down in Elizabethtown, N.Y., managing to keep them engaged even as rain began to fall on the outdoor venue. He plays some 250 shows a year, always with that same Dumpster guitar. While Lorenz's accumulation of junk is compelling, the most distinguished part of his act is another vocal trick that originated in Mongolia: throat singing, in which more than one pitch can be sung simultaneously. Lorenz says he learned how to do this by accident. While in college, he took a South Indian cooking class in which many of the dishes' names had a retroflex R — that is, the letter is pronounced with the top of the tongue on the roof of the mouth. He was singing in his car with his mouth in that shape when he discovered that it created an overtone sound. Lorenz practiced overtone singing exclusively in his car. Only years later, when he found the guitar, did he put the two together and decide it sounded good enough to play for listeners. When he's not performing solo as the Suitcase Junket, Lorenz plays in the Northampton, Mass., band Rusty Belle with Zak Trojano and his older sister, Kate Lorenz. Even after 33 years of making music together, he says, harmonizing with his sister is still a magical experience. The Suitcase Junket plays Signal Kitchen in Burlington on Saturday, November 14, 8:45 p.m., with Mal Devisa and Dietrich Strause. $10/12. AA. The original print version of this article was headlined "One Man's Trash"